MD Opinion: (Can’t Get) Home on the Range? Isn’t it time that someone in the motorcycle business, anyone, tried to reverse a trend in motorcycle fuel-tank size and carrying capacity that seriously affects motorcycling? A basic criterion for a sportbike ride, given an ergonomics package acceptable for physical endurance, is range. Next to that need is the ability to carry a modest amount of gear—say, a change of clothes—leathers, jeans, underwear, sneakers, cell phone and bottle of water. Considered here, primarily, are the 600-1000cc bikes that are among the most popular sold. Though a tiny proportion end up on the track, most are bought by riders who seek utility as well as sport pleasure. They want to go places, not just beat up the nearest twisty. Secondarily, we should include ‘cruisers’ that are notoriously short legged. For sportbikes, lack of range is a serious problem. One hundred miles is much too short a range (straight out or 50 miles out and back to a gas station), 125 miles is marginal and 150 miles the minimal acceptable distance a rider should be able to go, riding at his or her safety level on roads sufficiently remote that conflicts with civilian traffic are minimal while using the motorcycle to its design specifications: fast, with a lot of pinned throttle. Most of today’s sportbikes, ridden aggressively to limits acceptable on remote public highways, deliver, at most, 100-125 miles of range to reserve. They are designed and built in Japan or Europe, where longer range doesn’t matter much. In the U.S, particularly in the West, it does matter. A lot. All the latest middleweight and open-class sportbikes are great motorcycles that can be ridden fast for 6-8 hours, as they are designed to be ridden. At fuel-consumption levels these bikes deliver on wide throttle openings—roughly 25 mpg for the open-classers, 30 mpg for the middleweights, at best, on four-gallon tanks—a rider can go about 85 to 110 miles before risking running out of gas. If you’re more than 10-15 miles from a gas station (25 if you baby it—.ed), after riding those distances, prepare to walk. Back off the throttle, negating the bikes’ purpose, and you get 110-135 mile ranges. Drone for maximum economy (why buy such a bike?) and you might get 135-150 miles at best. Most sportbikes are miserable to ride slowly. Consider, in evaluating the above range, a typical popular motorcycle road for California sportbike riders, ridden by thousands annually: Highway 58. Check the map. It comes in from the Arizona state line, passes through Buttonwillow on I-5 (gas stations), becomes ‘interesting’ at McKittrick (no gas station) and ends at Santa Margarita (no gas station), where it meets Highway 101. You must ride 12 miles further, to Atascadero, for gas. Los Angeles-area riders typically take 33 through Taft to McKittrick. Buttonwillow and Taft are each 90-plus miles from Atascadero. A sport-bike rider using the full performance of a sport bike cannot get from Buttonwillow or Taft to Atascadero reliably. Starting from Atascadero and riding east, a rider must turn round long before the ‘interesting’ road goes straight, or run out of gas. A favorite turnaround spot is the so-called ‘Dinosaur Ranch,’ 70 miles from Atascadero. An enthusiastic rider cannot turn ’round there but must continue into Taft for fuel (if he or she can get there), unacceptably lengthening the day’s ‘interesting’ ride. This is only one of many roads that cannot be ridden comfortably in the American West on typical modern, range-limited sport bikes. Reverting to the popular Ducati 1198 and 848, among the most desirable bikes sold, with four-gallon tanks, it should not take engineering genius to add two gallons of fuel (the 851 and 888 of blessed memory had 5.2-gallon tanks). Two gallons would add 16 pounds to the wet weight but would extend their range to the minimum acceptable length, ridden to design capability. The Ducatis are only examples: most of today’s high-performance sportbikes have identical range problems. Honda’s and Suzuki’s big V-Twins of the 1990s were similarly afflicted and did not become market leaders. The ‘new, improved’ Honda VFR1200 has a range, including reserve, of about 160 miles and its tank is less than five gallons. Turning to the cruisers, this test rider had to ferry an H-D Street Rod from San Francisco to the H-D Press shop in Los Angeles and bring back an 883. Going down on I-5 (no back roads were feasible—no gas), with gas stations often 35-40 miles apart, one had to stop frequently—about every 60-65 miles—or risk running dry. On the 883, with its tiny peanut tank, some of the ‘Next gas 30 miles’ warnings meant stopping even more often. These were difficult trips, yet not at all atypical of the kinds of riding many owners would want to undertake. When will manufacturers step up and give us range? Is it too much to ask? Carrying a small amount of gear is yet another issue most manufacturers give little or no thought to addressing. On most sport bikes, there isn’t even storage space for a credit card. Yet even vestigial thought would provide space. If, as we observe, bikes will start to use under-engine mufflers (as Buell did), providing a small storage space in the tail should be well within the capabilities of engineers who can coax more than 120 hp from 600cc engines. 2012 Moto Guzzi Stelvio – 8.5 gallon tank. I rode my 06 speed triple from Indy to Laguna, and had 2 gas station worries. At absolute max highway travel, the 4.6 gal tank will travel 180 miles. On mixed city or carving country rds, 140 is it. Another 1/2 gallon would be nice. As car mileage has increased, bike mileage has not (due to horsepower upgrades. About 15% of gas stations have closed as a result of larger car tanks and better mileage. That puts non full whale touring bike riders at a real disadvantage. I took a flexible 2 gallon fuel bladder with me, and used it once just to empty it since it was shifting all over my luggage. Here’s what I want: a comfortable sportbike that weighs less than 400 pounds and is capable of going close to 200 mph. It should handle like it’s on rails, be easy on tires, and have a belt or shaft drive so it never needs maintenence (but a center stand in case it does.) It should get at least 50 mpg and have a range of 250 miles per tank. I also want it to be able to hold a passenger and enough luggage for a week long trip, but cost less than $10k. Dream on kids. Suzuki Hayabusa, 200-230 mile safe range (5.8 gal tank), fuel gauge & oh sh*t I’m almost out of fuel light. More power than most people know how to use. After an 8000 mile, 10 day trip never needed chain adjustment. Only chain lube every 700-800 miles. With soft bags (tank, tail, saddle) can travel anywhere with all needed gear. Optional center stand make chain lubing and adjustment if or when needed a snap. Actually I’ve always wondered why the bike I had, which held 19L of gas had a nice locking flush intergrated cap, yet my pick-up truck, which holds 98L of fuel has a simple non-locking twist off plastic cap. My last four bikes have all had 6 or more gallon gas tanks. Vote with your checkbook. Why add weight with more fuel capacity? Just give us better efficiency. Efficiency=lower horsepower. Accept that and mileage comes easy. Since we’re talking about sport bikes with longer range, the bike with the lower horsepower number usually loses on the sales floor. Kawasaki Ninja 1000 is almost exactly what you’re describing. What is the fuel range on the Ninja 1000 anyway? I mean the ENTIRE tank not when does the fuel light come on? I think MD said 160 miles when the light comes on, and is there a gauge or just a light. I have to admit I was excited about the bike when it first came out but know from experience that I should wait for the whole new model euphoria to wear off before rushing out and buying one. Little things like the classic Kawabuzzy bars and pegs are things that seem to get washed over at first but later become issues that have to be dealt with. Yep. I just bought one a couple weeks ago. Comfortable, pretty light, good power. Only have a couple problems with it. Gas mileage isn’t very good so far. The gear ratioos are too close together…better suited to the race reps. The brackets for the cases are on back order (for 6 months!) and the service manual isn’t available to anyone (service techs at dealers included) until December. That aside. A thoroughly enjoyable bike. Also no centerstand and if I’m not mistaken, any provisions for mounting one. Unforgivable on a chain dive bike…well, any bike for that matter, but especially on a chain drive model. if you ride long enough and far enough, eventually you will have to fix a rear flat or at least adjust the chain or lube it. What kind of gas mileage (and range) are you getting, Bob? I didn’t really want my next bike to be fully clothed, but looks like something in the sport touring arena will be my best bet. The Ninja 1000 seems like a great value. Does it have any “buzziness” at highway speeds (70 – 85 mph zone). Yeah, I miss the centerstand already. I’ve become quite comfortable with belts and shafts the past 2 decades. There isn’t one being offered and there likely isn’t provisions for one. MAssive oversight by Kawi. Buzziness. Yes. Around 8k there’s some electric toothbrush range buzzing that tickles my arse quite intensely and a little reaches the grips and pegs. I added gel tennis racquet grip tap to the grips. MPG – I got 32 my first tank and 36 my second. I sure hope it gets better as it breaks in. Having to use the expensive fuel and that MPG is a double whammy. In S/W Ohio we are running into more and more gas stations that are carrying regular only. Had to pull out of one the other day on my ST 1300 which requires premium and go find another station. I wasn’t aware that the Ninja required high test. Too bad. I won’t buy another bike that requires premium. I really like the Ninja 1000. It’s a great package. I have a ’95 ST1100 and have had several V-Stroms. The ability to go over 200 miles is exceptionally nice when trying to cover long distances, or just traveling where there aren’t many fuel stops available. With about 7.5 gallons of fuel, the ST can actually do 300 miles. The Suzukis carry 5.8 gallons, and can go 200, even when pushed. I’m ready for a stretch by then anyway. 150 miles should be the bare minimum. Motorcycle sales have taken a nose dive in the last few years because the product planners telling the manufacturers what to design and build do not live in reality, or perhaps they are being paid under the table by their competitors to design the most useless ugly motorcycles imaginable to ensure poor sales, or they work for your mother-in-law and want to ensure that you do not buy another motorcycle. In the ’80 big sportbikes had adequate gas tank capacity and weighed 550 to 600 lb. Over the years, as sportbikes dropped down to 450 lb they lost their ability to be useful for sport touring or commuting because of their low handlebars and small gas tanks. Couldn’t they have low bars and a small tank as options for racetrack use and let the rest of us have a rational riding position with enough fuel capacity to make them good for fun rides and commuting to work? If they did, sales would not drop so drastically during bad economic times. Very few used sportbikes end up with high mileage since they are so uncomfortable and have such small gas tanks. I do not want the extra 50+ lb of weight and lower performance of the “comfortable and rational” sportbikes such as the new Kawasaki Z1000 and Ninja 1000, I want the full performance capability of a 1000 cc engine with a useful capacity gas tank and a comfortable handlebar position. Those requirements should not increase the weight of the bike by 50+ lb compared to the racetrack oriented 1000 cc bikes. Considering the big jump in price, why did the new V-Max weigh 80 lb more than the original, for that price, it should have been 80+ lb less. 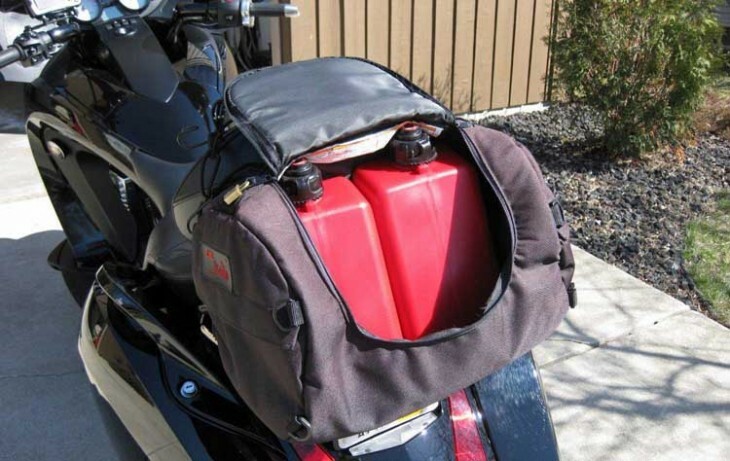 That funny hump on the new red Honda VF1200 gas tank is not a good place for a tank bag, and why is the tank capacity less than 5 gallons! What is all that useless plastic on the Suzuki B-King and Kawasaki Z1000? Get rid of if and have a less expensive and lighter weight motorcycle. Get rid of the product planners, they work for your mother-in-law! I think it might have more to do with the economy and the fact that 20% of the country is out of work. But go ahead and blame a couple of designers. Your’re right Time, some of the designs these days are just plain stupid. I have yet to see a B-King or the new VFR1200 on the street. I think nearly all riders have rejected these designs because the manufacturer’s are not in touch with the consumers desires. HONDA is especially bad in this regard with the most flops in the last 5 years. The B-King and Gladius are another 2 examples of orphans in the motorcycle world. I was all set to buy the “new” VFR1200 but decided to spend my money somewhere else when I read some of the reviews on it. It’s a crazy thing, but I would rather have and old gear-driven VFR from the 1990’s than HONDA’s latest $15,000 monstrosity that the VFR has become. I currently ride a ’99 Honda VFR 800 and *love* haul buns in the back county. We routinely see legs of + 180 miles between gas stations out near BFE. Needless to say, I am still riding my VFR 800 with it’s 5.5 gallon gas tank. geez, if i had a nickel…!? not saying this applies to you, but truth is most of those folks were just “talking sh!#t”. they went in to it LOOKING for a “dealbreaker”. and if you look hard enough, human nature is such that it will always find one. if it weren’t tank capacity…? it would be something else. truth is most are simply in love with the “idea” of buying, not the actual act of taking delivery. ran into a gent commuting on one the other day. wasn’t put off in the least by the tank capacity…? as a longtime honda-phile he simply wanted THAT bike… so he bought it…!? why that’s plum crazy innit…? he wasn’t “kvetching” over tank capacity…? he wasn’t looking for the “bigger and better deal”…? he wasn’t trying to avoid “paying alot for this muffler”…? he saw it at the bike show and KNEW he had to have it. I like the idea of taking delivery very much, and I have chosen not to buy bikes I really wanted on an emotional level because of fuel capacity. I like riding them, not filling them up with gas; and I knew I just wouldn’t get to “enjoy the zone” I get in while riding if I was constantly scanning for gas stations or even worse having to plan my rides around gas stations. If I kept multiple bikes in the garage, I would overlook the range of certain bikes and just get them anyway. But the wife, not yet at the same stage of enlightenment as myself (or perhaps she is just smarter), doesn’t see the logic in having more than one at a time, so how far a bike can go between fillups can be a deal-breaking issue for me. I get your point, and it is certainly valid. Lots of people ask for these features or “have their checkbooks ready” waiting for this bike or that to hit the dealerships and then… do nothing. Just buy a new Multistrada, I did! Highway I can get 300 (not two but THREE hundred) miles out of a tank, and in the twisties it’s as fast as any sane person wants to be. Cheap? No way. Worth it? It is for me! BTW previous bike was the new CBR1000RR, the Multistrada feels like a couch and I haven’t lost so much performance as to make me miss the CBR. Step 2: Enjoy 200 miles on a tank when ridden reasonably. Or, conversely, enjoy 160-ish miles when ridden like a scalded baboon. Step 4: Profit! Or, better yet, enjoy the ride. East coast is a little tighter, my friend. There are places out west that need 280 to 290 miles between gas stops! I have 43,000 miles on my 05 Harley and have had to carry a spare 3 gallon plastic tank on occasion. Go west and get some miles in!! Like Danny said, it depends where you ride. In many places I’ve ridden, 125 miles between fillups means you’ll be filling up every 40 or 50 miles or so because you can’t be sure if you’ll see another gas station before you run out. Or there are some places you jusst won’t be going without a truck and trailer or some spare gas cans. Even if fuel availability wasn’t an issue, I still don’t like to have to ruin my vibe by stopping for gas so often. Just a personal thing. Why is everyone so surprised about modern sportbikes not being very fuel efficient and having small gas tanks? IMO, no one buys sportbikes based on their fuel economy and range specs, what draws them in is the performance potential [I know the majority of the population can’t ride them to even their stock limits, including myself]. Yes, in the realm of all motorcycles 25-30mpg might seem unacceptable, but it’s an apples to oranges comparison with anything other than another sportbike. Many new sportbikes have 2 sets of fuel injectors, so if you have an inline-4cyl then you have 8 fuel injectors. Then consider how much fuel you are using @ 12,000+ rpm and at least 12:1 compression ratios, although fun, not very fuel efficient. Manufacturers use the second set of injectors at high rpm to make sure your engine doesn’t grenade by adding more fuel, keeps the engine from running lean, lowers exhaust gas temps, and useful for tuning the max amount of power out those tiny engines. There is no one motorcycle that can do all the extremes, so buy what suits you, but keep your expectations realistic. I have a 2006 Ducati Monster S2R 1000 that suits me well, an easy 150mi range on the highway, fairly comfortable seating position, more than enough power, interesting to look at, and an exhaust sound that makes me smile every time I am on the throttle. I love all motorcycles, riding is riding no matter what you’re on [only exception would be scooters :o) ]. They all have their place. I never judge people on what they wanna spend their hard earned money on – motorcycles, cars, computers, audio equipment, house, wife, haha, you get the point. I digress. Please, don’t bother some here with practicality. Some want the bike to be relatively cheap, damn fast, poseur looks, and comfortable, all while getting at least 50 mpg. My bikes are from 250cc, 660cc, 750cc, 800cc. The 800 will do 125 mph if needed. They are all worthy of long distance rides. Some faster than others. They are shaft, belt, or chain drive. None of them are crotch rockets or cruisers. When I bought them they all had to meet certain distance/mpg preferences and comfort. I usually ride 400-500 miles a day on a touring trip. Sometimes have put in 800 miles days. So you’re telling us you want a Motus, right? As for Harley, they’re all about style, and not the “toaster tank” style, peanut tank and tiny headlight make the Harley fashion statement. If you want a practical Harley, get a bagger. I put Ortleib Dry Bags on my Speed Triple when I wanted to go for the day; while underway, I couldn’t tell they were there, but they carried everything I needed, with room to spare. I realize, when you’re picking up a free – sorry, test – bike, it won’t necessarily have saddlebags, to carry everything a journalist needs, but that’s life. I agree a big tank is a Bonus/Must out West! No way am I ditching my old 5th gen VFR for a 4 gallon tank bike. That’s twhy God invented sport-tourers. Great comfort, good cargo capacity, good fuel range and still fun on the interesting roads. I went from a 5.8 gal tank on my CBR1000 to a 4 gallon tank on my F800ST. I ride 200 miles before I need/want gas in my BMW. I would love to have 1 more gallon on board. That would give me a 250 mile range with a small amount left over. I agree with what someone else said here, this is where sport touring bikes come into the game. I started on the F800st and I always was around 200 miles to a tank. My 1975 R90 gets ~ 180 miles to a tank and my R1100rt gets ~250 miles to a tank. My most recent purchase is a Buell XB12XT and it gets ~160 mile to a tank. All of these bikes can be ridden in a sporty manner and can carry everything including the kitchen sink. I also had a 08 CBR600RR and it is a great bike but, I would never try going very far on it just for the reasons stated in the article. Have you guys noticed how sportbike when from “racer replica” from 80’s to supersport in late ’90s? For example, original GSX-R had 5 gallon tanks because they were based on endurance racers competing in 24 hours or 8 hours of Suzuka. Other companies followed suit. Then when R1 came out in ’98, they became more of a MotoGP style bikes thus tanks got smaller. Tourtanks makes auxilliary tanks for all manner of motorcycles, in different sizes. You can mount them, plumb them into your fuel system, or you can just carry them and use them to refill your tank. They’re crash tested, and pretty reasonable, considering the build quality. and fab’d right here in the good ole USA…! awesome. by the powers vested in me, i officially proclaim the problem of modern motorcycles and small gas tanks a “non-issue”. as you were. You’re talking $200 for an aluminum gas tank with no lock security. I know a biker who was @ a motel in Alaska w/an auxiliary gas tank when in the AM he found someone had siphoned his aux. tank ’cause it didn’t have a lock on the cap ! You can get a plastic gas tank, keep it out of the sun, and it’s safe to ride with. I’ve done it for many years. Even if the plastic tank is exposed to the sun/heat, release built up pressure with it’s vent when you stop and you’re safe. Not all of their products are immobile, or immovable. They also make units that pack away, out of site. They’re considerably less than $200, and they also sell locking gas caps. And I don’t consider the prices unreasonable, when you see the cost of accesories in general, especially for something made so well. And no, I don’t work for them. Ah yes, I had a 3 gallon TourTank mounted on the back of my old 883 Harley, and I loved it. It actualy carried more fuel than the stock peanut tank, and as much as I hate to admit it, I had the opportunity to crash test personally. I can vouch that while just about everything else on the bike was crushed, the TourTank was still intact and holding gas. Very good product, and $200 is a steal when you see how well made they are. No I have no other affiliation with them, just a very satisfied customer. I currently ride a Duc ST3 a nd with a 220+ mile range I don’t need another TourTank, but it’d be nice to reach 300 miles between fillups sometimes. I love my BMW r1200s,sporty in the canyons and comfortable to do extended weekends. Tankbag, tailpack and saddlebags, can carry enough for these rides and 45-50mpg.